My first encounter with the Penderwicks was two years ago, when I found the first book in a used bookshop in New York City and then gobbled the book up while reading outside in Central Park and other urban parks around the city. It was a lovely setting to read such a happy book. Fast-forward to this summer, when I found that the whole Penderwick series is available for digital audiobook download from the Chicago Public Library. Hurrah! Once again, I was ready for a fun summer read, though this time on my miserably long commute to and from work, not soaking up the sun on a beautiful summer's day. 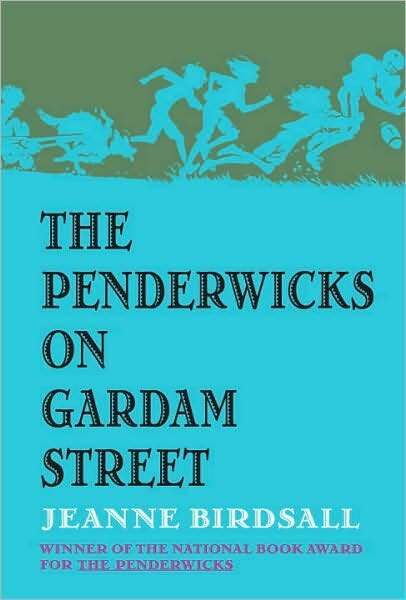 The Penderwicks on Gardam Street moves the action back to the Penderwick home. The four sisters - Rosalind, Skye, Jane, and Batty - are dealing with all the normal ups and downs of life in grade school quite well. Until one day their Aunt Claire tells their beloved widower father that he should start dating again. And then everything goes topsy-turvy and the girls - with the help of their good friends and the astrophysicist next door - need to find a way to set their lives back on the right course. The Penderwicks on Gardam Street has a very old-timey feel to it. For example, one of the first scenes has Rosalind, a 12-year-old, baking a pineapple upside-down cake all by herself, which is not something many 12-year-olds do these days. There's also no mention of computers or cell phones, of TV or internet. The girls play outside, go for walks in the woods, and generally seem to live outside of the modern age. It's delightful to hear about their lives but really impossible to believe that they exist in the world today. So many young adult books today deal with all sorts of heavy stuff - mental illness, broken homes, abuse, and all sorts of other drama. The Penderwicks series does none of that. These are happy, attractive, intelligent children from happy, well-adjusted families. I appreciate that because, well, it's nice to know that some kids can just grow up generally feeling good about life. But it also made the book feel very young to me. Everything worked out so neatly and perfectly in a way that doesn't really happen in books written for even a slightly older audience. I think if I were 8 years old, I would treasure this book and this series and want to learn how to make pineapple upside-down cake myself. But at 30, it just made me feel like my own childhood was not quite as perfect as it could have been and also - should I have known how to make pineapple upside-down cake at 12 years old? This looks great. Can't say I've heard of the series before but it sound a little like Ballet Shoes maybe? Thanks for this. I will look into this series. I am just now reading the first Trixie Belden book. :<) I never happened to read TB when I was a girl. I love this series, not least because in the first one, they had a pet bunny. As Chasingbawa observes, her writing is a bit like Noel Streatfeild's. I love this series -- it does feel old-fashioned, like The Saturdays and books like that. It makes me feel like I'm in my own childhood again. There aren't enough books like this being written now. I often want miserable things like Patrick Ness, but I also sometimes want lovely happy things. I like the sound of it, though the way it seems the time period doesn't quite work would possibly put me off - it would really depend on the exact timing for me. I love these books just for the reasons you mention—that they have a very old-fashioned feel to them. I loved the Ramona books for the same reason when I was a kid; and they were, in fact, old-fashioned by the time I read them! I went to a children's lit event at the NYPL that had Jeanne Birdsall on a panel, and these books should be considered Middle Grade, not YA. That was a very clear distinction she made—and it was a panel on Middle Grade reading. You're right in the fact that these don't deal with such heavy topics as most modern day YA...but that's why; they're not actually YA. The panel made some interesting points as to what exactly defines something as Middle Grade, and the best summary was that it provides the reader, whether through tone or technique or just a few hinting words, a security blanket of sorts; though things may get heavy or scary, the characters (and thus the reader) are reassured that everything will be ok in the end. The best example of this is using brief almost parenthetical language like "when she thought back to this moment..." or "the dog that would eventually be..." just to give a tiny peek into a future where it all works out.